DOVER AIR FORCE BASE, Del. (Jan. 07, 2000) -- While many Eagle Wing members feigned surprise as they unwrapped ties or fruit cakes this past Christmas Day, three enlisted members received a real surprise they will not soon forget. Staff Sgt. Brian Bossio, a dog handler with the 436th Security Forces Squadron, Tech. Sgt. 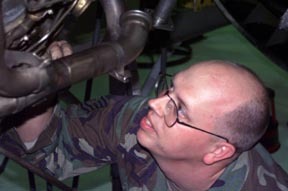 Joe A. Gahan, a jet engine mechanic assigned to the 436th Component Repair Squadron, and Master Sgt. Richard A. Brewer, noncommissioned officer in charge of anti-terrorism with the 436th SFS, were all greeted Christmas Day with STEP promotions. Master Sgt. Rich Brewer, 436th Security Forces Squadron is part of the Air Force's elite Security Forces organization, The Ravens. 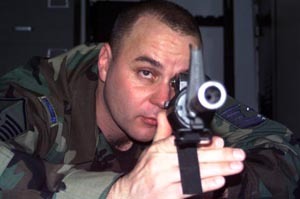 Brewer is a a full time anti-terrorism instructor with the DAFB Security Forces Squadron. Col. S. Taco Gilbert III, 436th Airlift Wing Commander, and Chief Master Sgt. Bill A. Scott, 436th Airlift Wing Command Chief Master Sergeant, delivered the stripes to the three at their homes. The Stripes for Exceptional Performers program is designed to meet those unique situations where in the commander's judgment, an individual clearly deserves a promotion. Under this special program, commanders of major commands, field operating agencies and senior officers within organizations with a large enlisted population, may promote a limited number of airmen with exceptional potential to staff sergeant through master sergeant. Promotees were both surprised and excited when they learned they were promoted. "This is great," said Brewer. "It's the best Christmas present I could have had." "I was at home, and my wife saw Chief Scott outside through the window," said Brewer. "My wife and I met the chief at the door. Colonel Gilbert came forward and said I was out of uniform." Brewer then learned what the commander meant by out of uniform. He was given a brand new set of master sergeant stripes and was told they would need to be sewn to his BDUs in order that he be in proper uniform the next duty day. Tech. Sgt. Gahan, promoted from staff sergeant, works in the jet engine facility on base. His wife is a familiar face in the check-out line at the Patterson Dining facility. Both were shocked when they learned Gahan would be promoted to technical sergeant. Tech. Sgt. Joe Gahan, 436th Component Repair Squadron, works on the fuel system of a C-5 Galaxy jet engine. According to Chief Scott, it is best to have both the STEP promotee and their spouse available when the new stripes are presented. Trouble brewed when Chief Scott and Colonel Gilbert learned Gahan's wife was at work and would not be available to witness the step promotion. "Well, they came over to the house and I was in boxers and a tank top," laughed Gahan. "They asked if my wife was there, but my wife was at work. They said they would come back later." Gahan subsequently called his wife home from work. The two feared there may have been some sort of trouble. Both were surprised, however, when Chief Scott and Colonel Gilbert reappeared with new technical sergeant stripes to be sewn to his uniform. "What a shock," said Gahan. "I didn't even know I had been put in for the promotion." Gahan still seems a little shaken by the whole event, but says his job will probably be unaffected by the new rank. He does plan to use the pay raise associated with the promotion to bolster his savings, and perhaps look into getting a new car. Staff Sgt. Brian Bossio, a drug dog handler with the 436th SFS, had a schedule that would make it difficult to get him his new stripes with a suitable audience available to enjoy the surprise with him. "I never would have anticipated it would be so hard to hand out stripes," said Gilbert. "I knew he would be working Christmas day. So I figured we would swing by his home Christmas Eve. I wanted the family to be part of this." Staff Sgt. 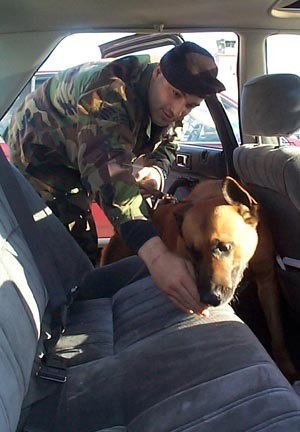 Brian Bossio, 436th SFS and his drug dog, inspect a vehicle for contraband. "The chief and I went over about 8:30 Christmas Eve. There was nobody home but him.," said Gilbert. "I tried to explain why I was knocking on his door on Christmas Eve, but all I could say was hello. I left him quite confused." After making three failed attempts to meet Bossio on the flight line to present him with the new staff sergeant stripes, Gilbert decided on an unusual method to guarantee Bossio a large crowd of his peers for a Christmas Day presentation of the new stripes. "Like all wing commander,s homes these days, I have a duress alarm on my home. I knew how to generate a crowd," laughed Gilbert. " I went in, and hit the duress alarm. It generated more blue lights than you could imagine would be possible on Christmas morning. We got a crowd, and then called Senior Airman Bossio over and presented him with his new stripes." Bossio was quite surprised at the event. "The Colonel set off the duress alarm and had security forces respond. I was a response force leader there," said Bossio. "Colonel Gilbert had another security forces officer pin the new stripes on to my sleeve." Bossio is prepared for what comes with the extra stripe. "I will now have more responsibility," said Bossio. "There will be more of a leadership role, and my job will become more demanding."